At Westford Pilates & Yoga, our aim is to bring mind/body balance to the challenges of daily life. Our instructors are passionate about helping you to stay active no matter what your ability level. Whether you choose a group class or a private/duo on the Pilates reformer, you will enjoy one of our supportive, expert instructors who will work with you to improve your strength, posture & flexibility. Our team of instructors has experience working with a broad range of exercisers from total beginners to athletes, so you will be in good hands. 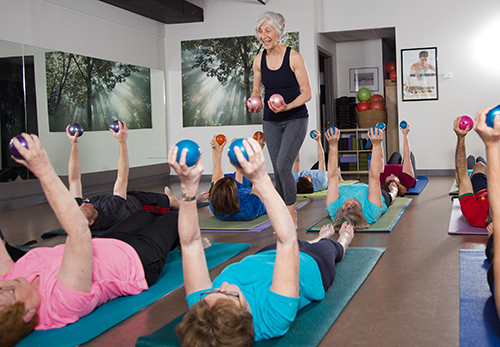 Plus the beauty of Pilates is that it provides a foundation of strength for people at all levels, and the exercises can be performed with slight variations to make them easier or more challenging – same with yoga. We love that Pilates and yoga develop flexibility, postural improvements, and core strength. Once your core is strong, everything else is stronger too. We also love that Pilates and yoga are mind/body practices! They take our full attention to work through the subtle movements using our deepest muscles. The result is great physical strength accompanied by a focused mind. We have seen amazing results in our students. Many of our students have eliminated their nagging back pain, been able to exercise through injury, and recover from surgery and disease. We have even seen non-exercisers build new exercise habits! The bottom line is we care about your progress, you goals and your safety. We look forward to helping each and every client address their individual needs.